Welcome to Aperture Storyteller. Formerly known as Frontal Lobbings. This site is devoted to the art of visual storytelling, through the lens, art and communication. As your host, I'll present thoughts, techniques, and just stories that involve my work as a life long visual storyteller. I decided to make my own DIY adapter for this partially because it takes forever for orders from my vendor to get to me (4-6 weeks) and the other being the obvious DIY motivator, price. 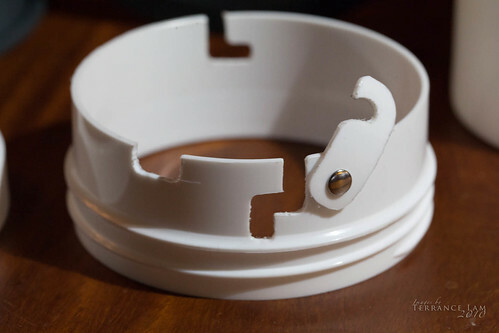 I decided for the cost of the RQ adapter, and the Lastolite Speed ring, that I could probably easily manufacture my own. I had initially planned on making something out of sheet metal, but by luck I happened on some cosmetic storage jars that were a perfect fit. 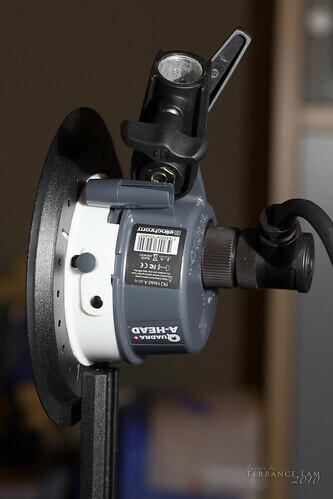 After a few attempts, I ended up with my Mark II version of a DIY adapter ring for my modifiers. This allowed me to set my Quadras directly into the modifiers without any brackets. 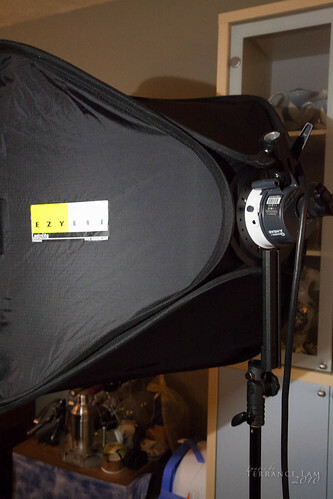 Both the Lastolite Ezybox and my Cameron Beauty Dish uses the nearly identical speed ring bracket. The bottles cost approximately $2 with lid (I bought half a dozen of them). I bought the lids thinking I would use it somehow to fit to the speed ring bracket. These jars are pretty standard type of containers that you should find at most plastic supply shops. They are generic 3 inch wide mouth mason plastic cosmetic jars. No brand name attached to them, but they often come in 8oz sizes. Using a band saw, I carefully cut the bottom of the jars off, and then tracing and measuring against the Quadra heads. I cut out the bayonet notches using a Dremel™ zip cutter bit. Flame polished it with a propane torch to take off most of the fraying. My earlier version worked very well, but I was a little concerned about the plastic bayonet fittings not being strong enough to hold the heads secure enough. So in this version I put a safety lock onto it made from the excess bottle material and a quick set rivet. Definitely no issues with security now. By sheer chance, the bottle fit the speed ring bracket perfectly. 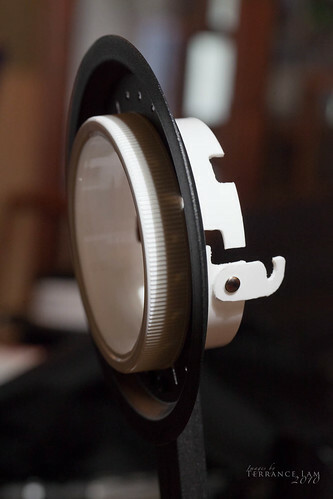 In fact it also threaded in nicely, and the lid actually worked very well as a tension/retaining ring. I cut a hole out of the top of the lid and left the outer ring to act as a tension ring. The quadra fits perfectly into the bracket without any major issues. 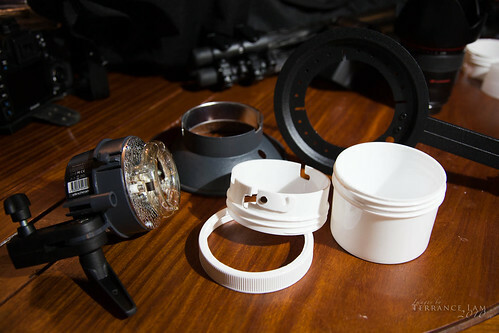 The retaining ring does surround the strobe bulb slightly, however it doesn't appear to affect it's performance. In fact when the flash head fires, the white plastic does light up nicely (maybe 2 stops loss). The light coming from the back is very minimal and does not cause any major spill or leak (I'm trying to find a black version of these jars now). the adapter as all it holds is the Quadra in place. All told, it took me approximately 30 minutes to make. One needs to be patient with the zip cutter as it tends to drift and potentially ruin the project (I did ruin a few before I got to this version). I recommend if you do try to do this yourself to get a few extra bottles to destroy. I do have a tool shop with a few things that makes this easier. You could do this with just a basic coping saw but it might not work as well. You could also use a drill and just buy the zip bit which should still work but just make sure you secure the drill in a bench vice or some clamps against a saw horse. Flame polishing is necessary to take off the fraying, but if you don't have a torch, then a stove element will also work, just be careful handling hot plast over a stove can be very dangerous. I saved easily hundreds of dollars with this DIY so it's certainly one of the more worthwhile DIY projects I undertook and I'm very happy with the OEM look of it. If I come across black jars, I will replace these with those, but for now, this project worked out very well for my purposes. 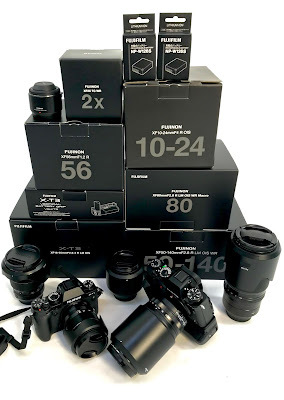 Hello FUJIFILM...Photography is not a Competition!